Bernice Steinbaum, – es una figura legendaria en el mundo del arte, primero por la galería epónima que fundó en Nueva York en el 1977 y después al establecerla en Miami en el 2000. Se destacó por apoyar y promocionar a las mujeres y las minorías, quienes no recibían la representación ni el valor que merecían en esa época. by Neil De La Flor | Miami New Times – The legendary gallerist, who opened her eponymous gallery on a semiquiet corner of NW 36th Street in the quasi-industrial and working-class community of Wynwood 15 years ago, helped turn the former warehouse district into a bustling arts haven. Ten years later, she closed her space, saying it was “time to pass the gauntlet.” Read the entire New Times article. Our Threads of Connection Catalog is available for purchase. Please contact us for more information. You may also download the Threads of Connection Catalog (35 mgs). 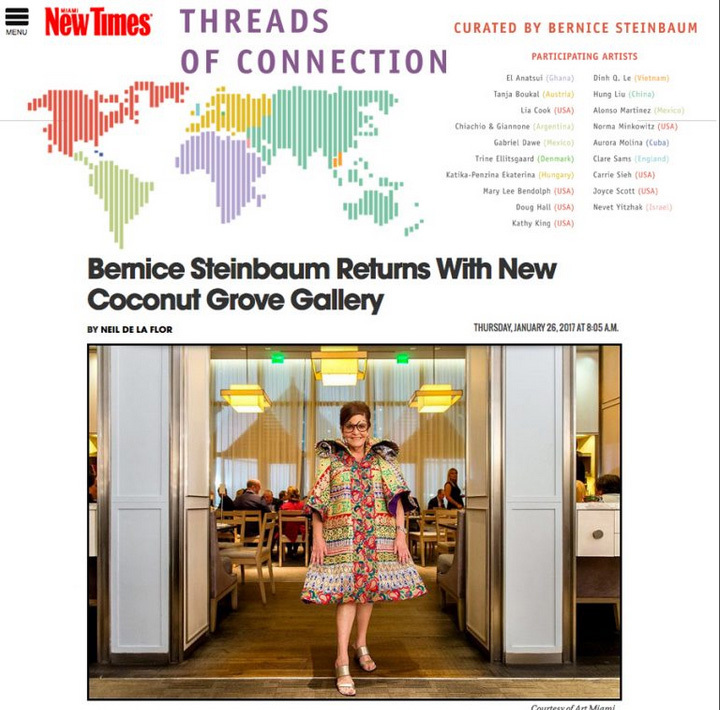 Bernice Steinbaum of Bernice Steinbaum Gallery is undoubtedly one of Miami’s most celebrated gallerists, closing her New York gallery in 2000 to plant new roots in what was then hailed the rather ‘seedy’ Wynwood district. Steinbaum is a pioneer in many respects, with an unwavering mission that refused a ‘separate but equal’ model of representation. Amongst the artists she represents and showcases, half are women, 40 percent are artists of color. At this year’s Miami Art Week, Steinbaum looked for artists whose work used found or repurposed materials and spawned environmental discourse. Art Carnival with treasures worth the hype. And if the tyrant pictured by Longo moved us intimately, the irreverent installation of the Cuban fiber artist Aurora Molina at Bernice Steinbaum Gallery was a snapshot of our times: five leaders depicted as scarecrows, each with the head of his country’s national bird atop his body, all caught in easily identifiable attitudes, while a sixth scarecrow, Pope Francis, as the dove of peace, absolved them all. who was as stylish as ever in her favorite slippers. Bernice Steinbaum Gallery, of Coconut Grove, Florida offered a fun and whimsical booth with an animal theme (flamingos for Florida and pigeons for New York, explained owner Bernice Steinbaum to us). Alongside a fantastic-looking lion and iridescent wall-mounted walrus by Enrique Gomez de Molina, were large black and white drawing/installations of towering skyscrapers and pigeons by Jennifer Basile, and computer renderings of various “digital” i.e on screen birds in real cages, by Troy Abbot. Cuban artist Pavel Acosta’s near-identical replication of a Frida Kahlo self portrait, made entirely with paint chips “stolen” (as the artist describes it) from crumbling structures throughout Havana, holds a commanding position on the outside of the Steinbaum booth. As a pioneer in art dealing, Bernice Steinbaum has been a fervent advocate for artists of minority. She made a fissure in the art market of the ’70s and ’80s that bore ripples in standards of a “traditional artist” today. Her role was a deeply formative one for many artists. Art Miami Kicked Off its 26th Year with a VIP Cocktail Reception. To kick off its 26th edition, Art Miami, America’s foremost contemporary art fair, hosted a private cocktail reception and screening of the award-winning film “Bernice” at JW Marriott Marquis. Presented by Art Miami and Merrill Lynch Wealth Management, the event honored Bernice Steinbaum, who is celebrating her 10th year exhibiting at Art Miami. Artist Enrique Gomez de Molina, left, talk among friends underneath his piece “Showgirl” with Rick Mattaway, center, and his wife Lisa, during his exhibition inside Bernice Steinbaum Gallery at Art Miami as it opened its doors in Midtown. See page 7 of the complete slideshow from the Miami Herald. Art Miami, entering its 27th edition, remains the most established art fair in Miami. It expanded its scope with Art New York, and this year, with the inaugural Palm Beach Modern & Contemporary Fair. As Miami’s premier anchor fair, Art Miami attracts thousands of collectors, dealers, curators, and artists from all over the world. With a showcase of more than 125 international art galleries, this fair shines a spotlight on every gallery and artist who are involved. Here, a couple of Miami’s top galleries and a couple of their artists share their views on Art Miami. Bernice Steinbaum Gallery has a long history of exhibiting at Art Miami, and the fair has been very good to her and her artists. Kicking off its 26th edition, Art Miami hosted a private cocktail reception and screening of the award-winning film “Bernice” — the story of art pioneer Bernice Steinbaum’s lifelong efforts to assist artists of color and female artists in achieving the recognition they deserve. The event also celebrated her gallery’s 10th year as an exhibitor at Art Miami.